Next big event is Paint Your Heart Out on February 18th, 2017. 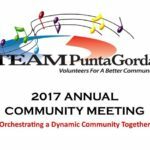 TEAM Punta Gorda Contributing Memberships run from January 1 to December 31. Now is the time to join or renew your contributing membership. Go here to renew on-line or download a paper form to pay by check.